Bilateral relations with NATO ally Turkey are probably not on president-elect Donald Trump's top-50 priority list. All the same, when Trump's diplomats will have to work with Turkey on issues that may soon gain prominence -- such as Syria -- they will have to deal with a man who says he does not mind being called a dictator. Instead of resembling a Western democracy in the European Union -- to which Turkey has long been struggling to join as a full member -- Turkey increasingly looks like Kim Jong-Un's North Korea. Most recently, the World Justice Project placed Turkey 99th out of 113 countries on its Rule of Law Index 2016, performing even worse than Myanmar and Iran. The index measures nations for constraints on government powers, absence of corruption, open government, fundamental rights, order and security, regulatory enforcement and civil and criminal justice. Turkey is also now the world's biggest jailer of journalists and academics. It also claims the title of the world's biggest jailer of opposition politicians. The World Justice Project ranks Turkey 99th out of 113 countries, below Myanmar and Iran. A dozen lawmakers from the pro-Kurdish, opposition Peoples' Democratic Party (HDP) were detained on November 4 because they refused to give testimony in criminal proceedings. Prime Minister Binali Yildirim said that democratically elected officials normally can only be forced from office in an election, but those officials who mix with and encourage "terrorism" must face legal proceedings. Turkish prosecutors began probing more than 50 HDP members of parliament after the legislature voted to scrap immunity in certain cases. Turkish officials say HDP lawmakers were detained because they refuse to testify in their cases. On the same day that Turkish police detained Kurdish lawmakers, Turkey restricted access to multiple social media services throughout the country, including Facebook, Twitter and YouTube. Restrictions on the messaging services WhatsApp, Skype and Instagram were also detected, validating widespread user complaints about WhatsApp service failure in Turkey. It was the first time Turkey imposed nationwide restrictions on social media. Turkey is now the world's biggest jailer of journalists and academics. The Turkish government regularly adds to its list of real or imaginary enemies. When a number of foreign diplomats attended the HDP parliamentary group meeting on November 8, Turkish Justice Minister Bekir Bozdag immediately condemned the envoys for supporting the pro-Kurdish party. Bozdag claimed that the diplomats' governments (Belgium, Luxembourg, Greece, Finland, Austria and the EU) failed to show support for Turkey's battle against "terrorism." Prime Minister Binali Yildirim said: "The ambassadors' duty is not to support separatists, it is to respect the sovereign rights of the country in which they work." According to Interior Minister Suleyman Soylu, the lawmakers represented "an understanding nested within a terrorist organization." All that exponentially grows Turkey's political distance from Europe and the West. The EU said a number of Turkish laws regarding fundamental rights were "not in line with European standards" and expressed "grave concern" over the arrests. "The anti-terror law [in Turkey] is not in line with the acquis [EU norms] with regard to its scope and definitions and its application raises serious fundamental rights concerns," the bloc said. But there was more criticism in Brussels. An unusually hard-hitting annual progress report voiced "grave concern" about Turkey's crackdown on opponents since the failed coup of July 15. The report said Turkey has rolled back the independence of the judiciary, freedom of expression and other fundamental democratic standards. the large scale and collective nature of measures taken over the last months raise very serious concerns. Turkey as a candidate country must fulfil the highest standards in the field of the rule of law and fundamental rights. In this year's report we therefore stress Turkey's backsliding in the area of rule of law and fundamental rights. The report only provoked more Turkish ire. As his government rebuffed the report, Erdogan referred to its content as "shameless." That was not surprising for anyone. 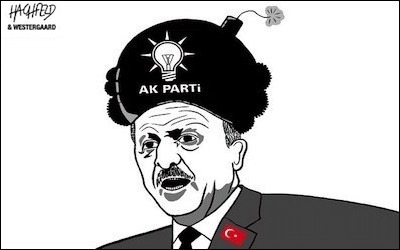 Only a few days earlier, Erdogan put his thinking plainly: "I don't care if they call me a dictator. I care about what my people say about me." There is little Europe can do about the dictatorship emerging at its doors. There is little Europe can do about the new dictatorship emerging at its doors. Germany is offering dissidents asylum. Michael Roth, state secretary at the German foreign ministry, said that Germany is open to providing protection for Turks who have been "politically persecuted" by Erdogan's government. He said: "All critics in Turkey should know that the German government stands in solidarity with them." But asylum can only be an individual, tentative solution for a few Turks when Erdogan targets millions. With a captain who does not mind being called a dictator, Turkey looks like a slow-sinking ship with a majority of passengers aboard dancing with joy, while a silent minority is systematically intimidated by the crew.